The Ultimate Character Record Sheet is a must for Games Masters and Players wishing to lift their characters from the page and bring them to life. 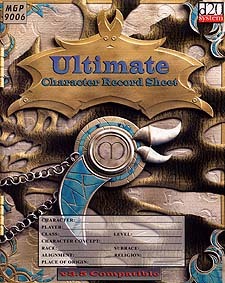 The Ultimate Character Record Sheet represents the pinnacle of keeping for your character. Featuring a host of newly designed pages that provides acres of space in which to document your characters every detail. From familiars to mercenaries, background, quirks, friends and allies, strongholds and more, the Ultimate Character Record Sheet will be an invaluable tool for Players of any fantasy d20 game.